For us in the United States, perhaps the most well-known (or even only known) Chinese holiday is Chinese New Year, which is usually celebrated sometime in January or February depending on the lunar calendar. 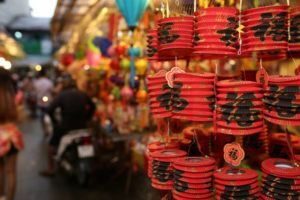 (For more information on this most important Chinese holiday, check out our Chinese New Year primer) But what about China's second biggest holiday and when is it celebrated? We've got you covered here with a synopsis of the Mid-Autumn Festival, or Mooncake Festival. The festival is always celebrated on the 15th day of the 8th month according to the lunar calendar, which means it usually falls in September or October according to the Gregorian calendar. This year, in 2017, the Mid-Autumn Festival falls on October 4th. The holiday's purpose is to celebrate the full moon, family, and to give thanks. It is a public holiday in China and several other countries throughout Asia. "In the ancient past, there was a hero named Hou Yi who was excellent at archery. His wife was Chang'e. One year, the ten suns rose in the sky together, causing great disaster to people. Yi shot down nine of the suns and left only one to provide light. An immortal admired Yi and sent him the elixir of immortality. Yi did not want to leave Chang'e and be immortal without her, so he let Chang'e keep the elixir. But Peng Meng, one of his apprentices, knew this secret. So, on the fifteenth of August in the lunar calendar, when Yi went hunting, Peng Meng broke into Yi's house and forced Chang'e to give the elixir to him. Chang'e refused to do so. Instead, she swallowed it and flew into the sky. Since she loved very much her husband and hoped to live nearby, she chose the moon for her residence. When Yi came back and learned what had happened, he felt so sad that he displayed the fruits and cakes Chang'e liked in the yard and gave sacrifices to his wife. People soon learned about these activities, and since they also were sympathetic to Chang'e they participated in these sacrifices with Yi." Much like Thanksgiving in the U.S., the Mid-Autumn Festival is a major Chinese holiday and primarily a time to be thankful and to gather with family. The roundness of the moon is a symbol of togetherness and harmony and most people celebrate by visiting family and extended family, sharing a meal together, enjoying the full moon, and partaking in local celebrations. 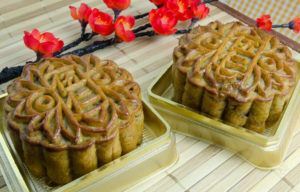 One of the most well-known aspects of the holiday is the exchanging an enjoying of Chinese mooncakes. Mooncakes are traditionally a round, sweet Chinese pastry with an egg and lotus or bean filling. But today, you can find endless variations of sweet and savory flavored mooncakes of all shapes and sizes. As is the case with many other Chinese holidays, the Mid-Autumn Festival also includes lanterns as part of the celebrations. 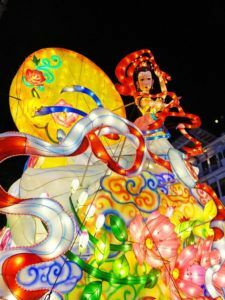 Most cities hold their own lantern festivals in conjunction with the Mid-Autumn Festival, and many families eat dinner together then go out on the streets to enjoy the bright and colorful lanterns adorning the area. A traditional game is to write riddles on the lanterns for others to figure out. Fortune-telling, dragon dances, and local carnivals and public events are also part of the celebrations in many parts of China, and they vary by location. No matter how it's celebrated, the Mid-Autumn Festival is an important holiday in the life and culture of China and many neighboring Asian countries. One of the best things about working with international students is getting to learn about and celebrate non-American holidays. After all, who wouldn't love to add some more holidays to the calendar? So even though our Chinese students are far from home, we at AmeriStudent want to celebrate the Mid-Autumn Festival with our Chinese and Asian students and help them feel close to their native holidays and traditions. This year, we are recognizing the holiday with many of our Southern and Central California school students from Fresno Christian, Village Christian, Heritage Christian, and Trinity Classical Academy. In conjunction with some of our partnering agencies, AmeriStudent will be providing special lunches, mooncakes, and notes of well-wishes to our Chinese students at our host families in celebration of the holiday. From all of us at AmeriStudent, Happy Mid-Autumn Festival! 中秋快乐!